German novelist, playwright, poet, critic, journalist, painter, theater manager, statesman, educationalist, lawyer, scientist, philosopher, alchemist, mystic and Freemason. He was a true Renaissance Man, a success at all of his vocations and avocations, but he was indisputably one of the greatest authors and poets of all time. The best known of his many works are Wilhelm Meisters Lehrjahre “Master William’s Year of Learning” (1821), Die Leiden des Jungen Werther “The Sorrows of Young Werther” (1774), Dichtung und Wahrheit “Poetry and Truth” (1811), and his masterpiece, Faust (posth. 1832). Faust is universally recognized as one of the supreme achievements in all of literature. 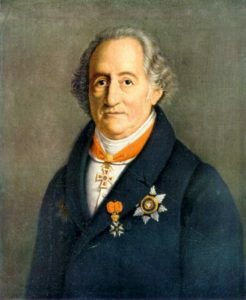 Goethe poured the entire vast reservoir of his wisdom and talent into this semi-autobiographical work, which deals with the spirit of Western Man, the dualistic dilemma between spiritual longing and sensual desires, aspiration and indulgence; and the drive for access to the infinite through knowledge. Faust is based on the legend of Dr. Faustus, also popularized by Christopher Marlowe. Although there apparently was an historical Dr. Faustus (John Faust of Wittenberg, c.1520 e.v. ), his mythical life story appears to have been built upon events from the lives of three other, more well-known men: Paracelsus; Johannes Heidenburg von Tritheim, also known as Trithemius, the Abbot of the Benedictine Monastery of Sponheim, who was one of Paracelsus’s teachers; and Henry Cornelius Agrippa von Nettesheim, a Qabalist and Neo-Platonist, a contemporary of Paracelsus, and his fellow-student of Trithemius and Reuchlin. In Part I of Faust, we find the Devil, under the name Mephistopheles, paying a visit to the Lord to chide him over the miserable condition of his creation. The Lord counters with the example of his faithful servant, the doctor Faust. Mephistopheles wagers that Faust, too, will fall into corruption, if he would only be allowed to spend some time with him. The Lord reminds Mephistopheles that His policy is not to interfere with the earthly enterprises of Mephistopheles. We next find Faust, a medieval physician, lawyer and theologian who has become frustrated with the emptiness of conventional learning and religion, and who longs for a more direct communion with the real knowledge of nature. Conventional studies having failed him, he turns to magic. He invokes the Spirit of Earth, who shows him even more clearly his divided divine/earthly nature. Leaving the murk for lofty heritage. His despair of the futility of his scholarly pursuits to free him from the restrictions of earthly life drives him to the brink of suicide, but he is unable to complete the final step. Having pursued the world of Spirit all his life, he now yearns to fully experience the joys and sorrows of the Earth. He visits the town, where he is lauded by the people as their benefactor, but he realizes how little he deserves their praise, for his accomplishments have all been trivial or illusory. He is visited by a dog, which presently transforms itself into Mephistopheles. Mephistopheles proposes to offer Faust all he may wish in life if Faust will be his servant thereafter. Faust agrees, but sets his own condition that Mephistopheles may only take him if he actually becomes contented with the things of the world. The bargain is made. A student visits, and Mephistopheles discourses ironically on learning. Faust and Mephistopheles then visit a tavern, where Mephistopheles toys with the patrons. They leave in disgust and consult a witch, who gives Faust a potion to restore his youth. Mephistopheles then assists Faust to seduce a young girl named Margaret, or “Gretchen.” Her brother, Valentine, discovers the affair and challenges Faust to a duel, which Faust wins. Valentine dies in Gretchen’s arms, cursing her. Unaware of this, Faust is taken by Mephistopheles to the wild celebration of Walpurgisnacht on the Brocken in the Hartz Mountains. At the conclusion of the festivities, Faust discovers that Gretchen has been thrown into prison for killing her newborn child. They return and visit her in prison, where she dies. Part II of Faust, while continuing the story of Faust and Mephistopheles, is more allegorical and symbolic than Part I. Faust and Mephistopheles visit the court of a medieval Emperor who is on the verge of losing his rule. Mephistopheles comes to his aid with the invention of paper money, and Faust is charged to conjure up Helen of Troy as an entertainment. He falls in love with the ephemeral Spirit of Helena, the perfect realization of idealized beauty. She vanishes at his touch, and he falls unconscious. Mephistopheles carries him off to his old study, where his former student Wagner has created, through an alchemical operation, a Homunculus, a tiny human being encased within a glass vial. Mephistopheles conveys Faust and Homunculus back in time to the “Classical Walpurgis-Night,” where they each may seek their desire: Faust his Helena, and Homunculus his incarnation. After a series of encounters with various figures of myth, Homunculus is carried to the sea, where he dashes himself against the throne of the beautiful Galatea. Faust’s quest ends in his union with Helena and the birth of their child Euphorion, who flies rashly up to the sun, only to fall back into the sea like Icarus. Helena, in grief, returns to her proper place and time. Faust and Mephistopheles return to the domain of the Emperor, who is now challenged by a revolution. Mephistopheles assures victory to the Emperor by providing him with a ghostly army. After the battle is won, Faust devotes his abilities to a great project, the reclaiming of a large tract of land from the sea. Near the completion of the project, Faust is again in old age. In order to complete the reclamation project, Faust commands that an old couple be relocated from their cottage to a new home which has been prepared for them. Unfortunately, they refuse to go, and Faust’s men end up burning down the cottage with the old couple inside it. Faust is again struck by the futility of his efforts, even with the aid of magic. He is near death, his labors have resulted in disaster, and he is no closer to personal freedom. However, he refuses to be defeated by care, and in his final moments, he realizes the true nature of freedom. Mephistopheles conjures his devils to capture Faust’s soul as it escapes, but a band of Angels arrives. Mephistopheles is distracted by the beauty of the Angels, and the soul of Faust escapes him. The Angels bear Faust’s soul into a high mountain valley, where, surrounded by saints, angels and mystic spirits, the soul of Gretchen arrives to serve as Faust’s guide into the ultimate regions of heaven. Goethe’s aim as an artist was always to uplift and liberate the human race. His wisdom grew out of a deep capacity for observation and introspection, and a mind that was never closed. His broad knowledge of diverse sciences and cultures enabled him to be an occultist without being superstitious, and religious without being sectarian. Though he never claimed to be a Rosicrucian, he deserved the appellation far more than most of those who did, or do.